For more information about Ice Skate Vauxhall, Private session hire and any general enquiries please us the form below or contact: info@iceskatevauxhall.co.uk. Tube: Vauxhall Station (zone 1) on the Victoria Line. Exit Vauxhall Station Via Exit 1 and turn right under the tunnel, walk to the end and turn right again. You pass the Royal Vauxhall Tavern then immediately turn left into the pleasure gardens. Walk into the pleasure gardens and you will be able to see us. Train: Vauxhall Station situated next door to the tube and bus station, this line runs to and from Waterloo station/Clapham Junction. Buses to and from Vauxhall: No’s- 2, 36, 77, 87, 88, 187, 344, 360, 436 Please Note- There is no parking. Please take public transport or taxi if you can. Get here by River, MBNA Thames Clippers serve St George Wharf Pier just a few minutes’ walk away from 0630 to 2140 on weekdays and between 0937 and 1824 on weekends. Please see www.thamesclippers.com for the timetable and more information. 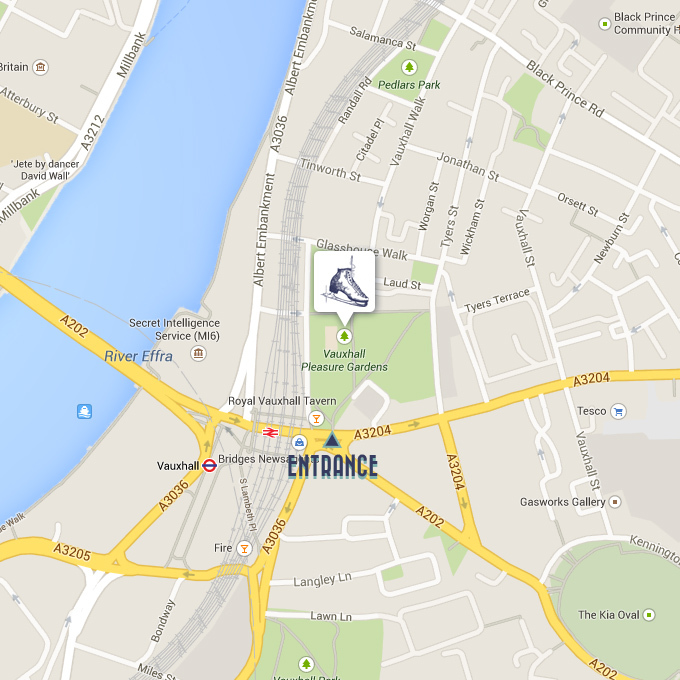 Novotel by Lambeth Bridge: 10 minutes walk.